Now that Naomi is one year old, I thought of collating her pictures taken in these 12 months to see how her appearance has changed in a year's time. It's pretty fun and interesting to look back at how baby 'changed' since his or her first days in this world, isn't it? Naomi hit her special milestone today - she turns ONE! It still feels a little surreal to me that 365 days have passed since I gave birth to Naomi exactly on this day last year. How baby grows up in one rapid blink! Anyway, my husband and I didn't really plan much for Naomi's birthday celebration today because we intend to hold a small birthday party for her next week when my parents are here (there... the secret is out now!). My Dad told me that my husband and I must at least do a simple celebration for Naomi's very first birthday exactly on her birthday. That's why, although next week Naomi will have her birthday bash, we bought her a birthday cake today. When the three of us did our grocery shopping this evening, we dropped by the one and only bakery inside the supermarket. My husband and I chose random small birthday cake with kiddie design for Naomi. I actually pretty liked the bakery's cute birthday cake with lots of colourful balloons decoration but the cake was way too big for us. The rests of the birthday cake design available at the bakery were not suitable for kid's birthday; hence, our option for Naomi's birthday cake fell to the below cake with extremely cheerful rainbow colour adorned by cross-eyed Doraemon (rocking his dashing bloody red lipstick) figure topper. Before dinner, we took some pictures of Naomi's birthday cake and hoped to snap some good pictures of the birthday girl and her first birthday cake at home. Apparently the latter was not possible to be done without drama if you have a super animated toddler as the main character. Alas, no good picture of Naomi and her birthday cake was taken today. See how the birthday girl refused to pose nicely today? Next, Little Miss Curious was always so eager to feel her birthday cake by hand and I was half a second late in keeping her hand away before she finally touched the cake. And boo... Now the cake's smeared in that instant second! Dad, let me touch the cake! After dinner, we went to my parents-in-laws' house because my husband wanted to do the birthday's cake cutting there. Soon after we arrived to Naomi's grandparents' place, all of us sang heartfelt birthday song in English and Mandarin to Naomi but apparently the birthday girl could not be bothered at all. When we sang to her, she was busy analyzing a toy on her hands. Trust me, I had been relentlessly singing "Happy Birthday to You" yesterday and Naomi always clapped her hands when I did that. Didn't know why our rehearsal didn't work out so well on the D-Day itself. Family picture plus Naomi's cousin. The only picture with Naomi's smile. Just when we were about to cut the smeared birthday cake, Naomi's almost two-year-old cousin helped Naomi blow the birthday's cake candle because the birthday girl has yet to reach her milestone in blowing candle. Right after we cut the cake, as per my husband's family tradition, the birthday girl had the first bite of the birthday cake. That's all about Naomi's modest birthday celebration today. P/S: Happy first birthday, my doll! Although you are a big girl now, you'd always be Mommy's little baby. Be happy and healthy. Mommy loves you to the moon and back! When I took a stroll at the Setia City Mall during my birthday last week, I had the opportunity to do a quick check at MPH's magazine shelves. It was truly a really nice surprise to find a short writing and photo of mine (taken when we visited Farm in the City few months ago) are featured at BabyTalk Malaysia's latest issue. This month, my opinion was featured on the magazine's page 13 under the "Mummy Says" section. My thought on stretch marks. I was so happy with this feature that I thought it was kind of another birthday present for me. This year's September 7th was indeed my lucky day. Last Sunday evening, my husband and I brought Naomi to the playground in our neighbourhood. The playground was quite a distance from our house so we rode our tandem bike to get there. Although it was not Naomi's first visit to the playground, Naomi had a total blast playing at the playground. We let her check out most of the recreational equipments that were suitable for her age. She was a lucky girl that evening because there were no other kids invading the playground so she could have the entire playground for herself. First, she played with the spring rider for few minutes but didn't do much with it other than looking around and nodding her head several times whilst riding this outdoor bouncy playing device. Then, Naomi got bored, made cat-like noises to signal us that she's done playing with this rider and wanted to move on. Next, my husband let Naomi try the smallest slide in the playground (whilst holding onto her body all the time). However, apparently, slide was not Naomi's cup of tea. I mean look at the below expression! Thinking back, slide was not my favourite item at the kindergarten or playground either because I had terrible fear of height. Like mother, like daughter. Stop, Dad! No more slide. Moving on, Naomi discovered much fun when playing with the toddler swing at the playground. She was very happy and could not stop giggling when her Dad gently pushed the swing. And to depict my lines above, here's a short video of Naomi playing with the toddler swing. Can we bring the swing home, Daddy? Overall we, or mostly Naomi, had a fantastic evening playing at the playground - well, except for the ending. Naomi found herself too attached to the playground after less than half an hour exploring it and refused to go home. She screamed when I carried her away from the playground. Worse, she cried when we sat her in our bike's child seat, which was very unusual, and only wanted to be carried instead. I couldn't ride the tandem bike alone so I got no option but carrying Naomi home while my husband rode the bike to get home. So yeah, last Sunday Naomi threw a strength test for Mommy. I had to carry my girl who's almost as heavy as the 12 kg LPG cylinder in walking motion for a couple of blocks. Halfway home, I almost gave up. I panted a lot. My left arm got really sore from holding Naomi for too long too. Fortunately, I passed the fitness test and both of us arrived home safely, in one piece. When Naomi was younger, my husband and I always put her in a stroller when we had our grocery shopping trip. She would then sleep or sit inside her baby stroller entranced by the supermarket's bright lights, sounds and colourful scenery while people passing by, gushing over her smiley face. when Mommy's busy with grocery shopping. As soon as she could sit without support, we let her ride in a grocery cart's child seat when we do about our grocery shopping. 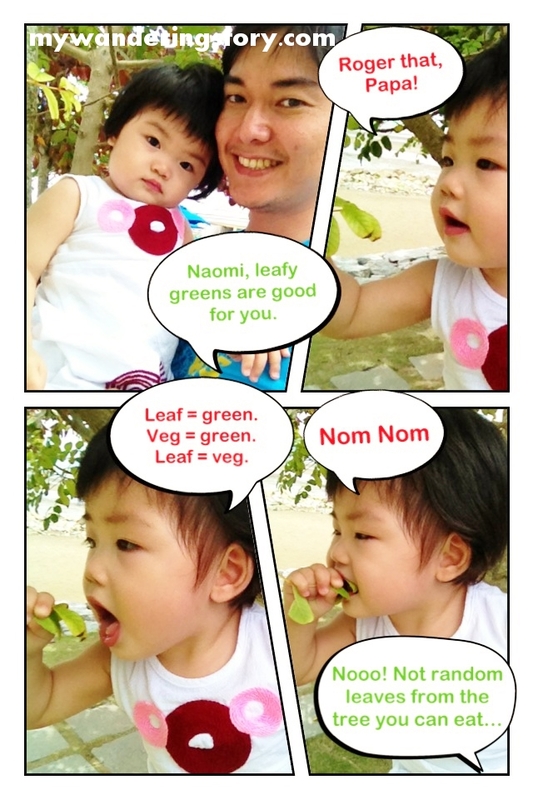 All this while, Naomi had been a pretty easy baby to handle when we brought her along to our weekly grocery shopping. She sat in the cart's built-in infant seat with no fuss and enjoyed looking around all the people and stuff inside the store. However, last night we had a different experience grocery shopping with Naomi. The moment we stepped in the local supermarket, my husband didn't immediately put Naomi in the cart's baby seat as per normal. Instead, he let Naomi set her foot in the supermarket for the first time. Needless to say, Naomi became overly excited and really hyper when she realized that she's now one free baby inside a massive shop with large space to explore and tons of colourful items to check out. When we realized this mistake, my husband and I tried to sit Naomi in the cart's child seat but of course, we failed to do so. This little girl wailed, screamed, kicked, etc. when we tried to make her sit in the cart's child seat - she just refused to sit down and wanted to walk around again. Soon enough, Naomi became the new star of Dora the Explorer for the episode titled Roaming Tesco. The first aisle she checked out when we arrived to the grocery store was the aisle which has shelves of various kid/baby toys. The section for kids' stuff is located around the supermarket's entrance; thus, without much thinking, Naomi hit this department first, as frenzied as possible. Busy bee invading the toys' section. I think Naomi was almost running with her mouth opened when she was surrounded by toys. She checked out almost all the different toys in the shelves while I kept asking myself on my chance in finishing my own grocery shopping attempt with snail speed (almost no chance to find my own stuff) and lots of pit stops to attend like this. Moreover, when Little Miss Curious did her toys' browsing, I had to closely stay behind her because she loved dropping toy after toy after toy on the floor. She picked a toy she liked and dropped that toy on the floor. I picked the toy on the floor up and put it back to its shelf. Then, she'd find herself another attractive toy to admire for 3 seconds, dropped it on the floor and it was my task to return the toy to its shelf again. This went on and on to the point that I almost looked like a celebrity baby's personal assistant who silently walked behind this VIP individual when she's doing her shopping spree or wait... maybe I looked rather like a litter pick-up volunteer inside the supermarket instead. Albeit it was nice and cute to see Naomi really happy doing her first 'shopping on her own' experience in the supermarket, eventually my patience ran really thin. Next, I randomly grabbed a purple doll next to me, put that doll on Naomi's hands and quickly put her inside the grocery cart's child seat. My trick worked! She forgot that she's not walking on the ground again and was busy analysing the dolls on her hands when my husband and I began our shopping peacefully. When Naomi got used to the normal shopping scenario in the cart's child seat and totally forgot the joy of roaming supermarket by foot, I took the doll back and put it back to the toy shelf. Well, well... welcome to world of grocery shopping with toddler! Apparently inspiration for Naomi's Comic struck me earlier than I thought. 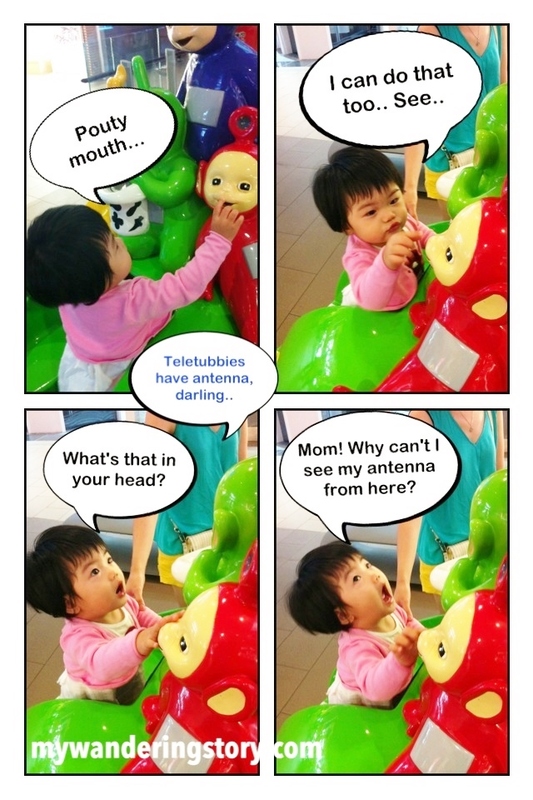 Here you go, the second issue of comic collated from Naomi's pictures. The above Naomi and Teletubbies' pictures were taken when we took a stroll at Setia City Mall last Saturday. In the mall, Naomi was playing with Teletubbies' kiddie ride for few good minutes whilst waiting for his Dad checking out some computer stuff. I put Naomi inside this kiddie ride so she could have some fun with the Teletubbies characters but didn't start any ride on this coin-operated amusement ride because Naomi is too young for this. To brighten today's Monday Blues, I've created a comic collated from Baby Naomi's pictures. The below pictures were taken when we visited the Golden Palm Tree Iconic Resort and Spa last Saturday. I will post more comics like this when inspiration hits me and I have enough photo materials to do this. See you again in the next comic issue. When I was a small kid, my Mom often cooked Beef and Bell Pepper Stir-Fry. Back then, I moaned whenever my Mom included bell pepper in every dish that she made. I hated the strong smell of bell pepper and the taste of it (although bell pepper is actually tasteless and not hot at all). Honestly, I am still not a big fan of bell pepper to date either. However, as I grew older, I began appreciating my Mom's particular Beef and Bell Pepper Stir-Fry as I think it's really a nice dish. Yesterday, I suddenly had a nostalgic moment thinking of the nice dishes that my Mom used to cook for us and I thought of cooking my Mom's Beef and Bell Pepper Stir-Fry. I asked her how to cook this dish via SMS and after I got her reply last night, I practised cooking it for today's lunch. All-time favourite Beef and Bell Pepper Stir-Fry. In a bowl, marinate beef with shaoxing wine, oyster sauce, light soy sauce, sugar and starch. Set aside for 15 minutes. Heat oil in a skillet or wok. Sauté garlic and onion until fragrant. Add the marinated beef into the wok and mix well with sautéed garlic and onion. Add the bell pepper slices. Add some water and season the dish with liberal amount of pepper and salt. Add more light soy sauce, oyster sauce and sugar into the dish, if needed. Continue cooking the beef and bell pepper slices until they are tender. This dish is easy and fast to cook but surely tastes delicious. If you eat beef and don't mind the taste of bell pepper, you should try this dish. Beef and bell pepper taste really good when paired. My husband who never ate this dish before loves it at first bite! On another not so related note, my husband could not help wondering the fact that I normally hate bell pepper but am suddenly in love bell pepper when it is cooked with beef like this. Women. Complicated and hard to understand. These days I noticed that Naomi's hair had grown pretty long. Her curls got kinda messy, especially during hot days, and I could not stand looking at her bangs which almost touched her eyes. Initially, I wanted my Mom to be in charge for Naomi's hair all the time. However, since she is only coming to Malaysia by the end of this month - I am quite sure by the time she arrives here, Naomi's bangs would be touching her nose. This said, I decided that it's time for Naomi's second trip to the hair salon. Yesterday, when I came up the impromptu idea of taking Naomi to a nearby hair salon, my husband objected. He confidently thought he could handle his daughter's fringe (better than me!) and planned to cut it all by himself. I instantly remarked "NO WAY!". This man insisted and was ready to find scissors to cut Naomi's hair. Then, I asked him to practice cutting the grass outside the house evenly first before cutting Naomi's hair. He just laughed my advice off. Both my husband and I continued our debates about this matter in jokingly manner for quite a while. Thank God, my arguments triumphed at last. I mean, come on.... There's no way on earth that my (soon-to-be birthday) girl's going to suffer the horrendous hairdo for months again. In fact, I have vowed that only real professionals get to do my baby's haircut even though there is not much hair will be cut or trimmed and to fulfil this pledge, I will always spare some budget for Naomi's salon trip(s). So here you go - Naomi's new haircut. 1 September 2013: Naomi sports her 6 RM's new hairdo. Probably her new hair doesn't look much dramatically different from the previous style but clearly it looks so much neater than yesterday afternoon and Naomi won't feel that hot every time the heat waves hit Malaysia.